It goes without saying that many cities across the world are hotbeds of air pollution. Much of this pollution comes from the traffic congestion clogging up busy city streets. People living in downtown areas, and those who drive through them on a daily basis, may be accustomed to the bustle. Residents of Paris, the capital city of France, are no strangers to the effects of air pollution. However, the city’s mayor, Anne Hidalgo, is doing something about it. A new campaign, Paris Breathes, has rolled out several initiatives to combat air pollution across the city. One of these initiatives is car-free Sundays on the Champs-Elysees. The Champs-Elysees is a world-famous avenue in Paris. It is 1.2 miles long and leads to the Arc de Triomphe, one of Paris’ prominent monuments, celebrated for both its history and its artistry. On May 8, the Champs-Elysees was declared car-free for the day, allowing pedestrians to stroll through the eight-lane avenue and visit the Arc at their leisure, without the familiar traffic whizzing by. This event was declared a success by Paris residents and tourists alike, and will be repeated on the first Sunday of every month. The Champs-Elysees is not alone in this initiative: 22 other streets will also go car-free on these Sundays, including streets along the banks of the Seine River and in the neighborhood of Montmartre. What’s even better is that in Paris, national museums are free to enter on the first Sunday of each month. This makes these Sundays perfect for leisurely strolls with family and friends to some of the most famous museums in the world — without breathing smog or dodging motorbikes and cars. Other measures taken by the Paris Breathes initiative include electric-car fleets and bicycle rentals. Wouldn’t it be wonderful if more cities around the world did this? While we sometimes need our vehicles to get around, if every city picked just one day a month to make some of its major streets pedestrian-only, a whole lot of carbon emissions would be prevented. While it’s not a total solution, it would certainly be a start. Hey Buddy!, I found this information for you: "Champs-Elysees Goes Car-Free On Sundays". 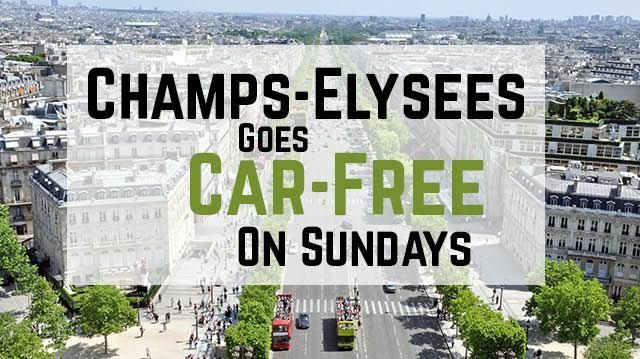 Here is the website link: https://www.thealternativedaily.com/champs-elysees-car-free-sundays/. Thank you.